Each with private en-suite bathroom with stall shower. 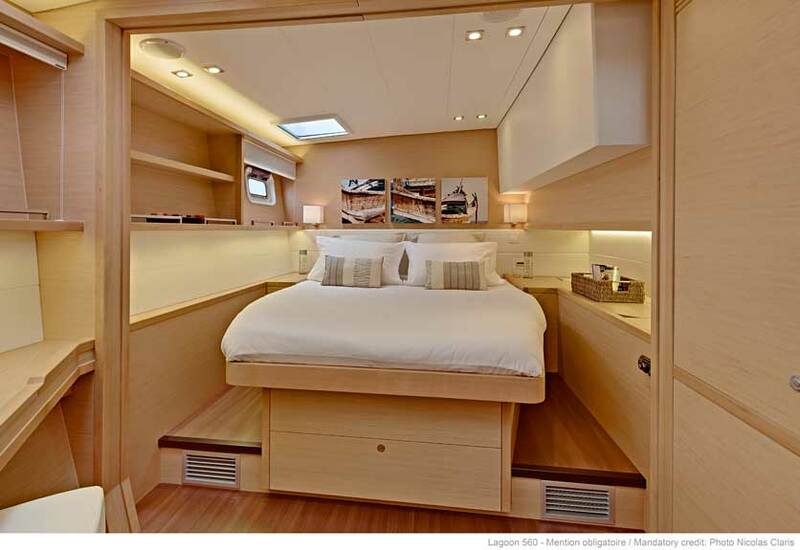 The crew will swap their upper and lower bunk-bed cabin with guests, if families need single beds. We are surfer friendly. We can take guests surfing. We know the spots. Surfboards must be requested in advance to confirm availability. 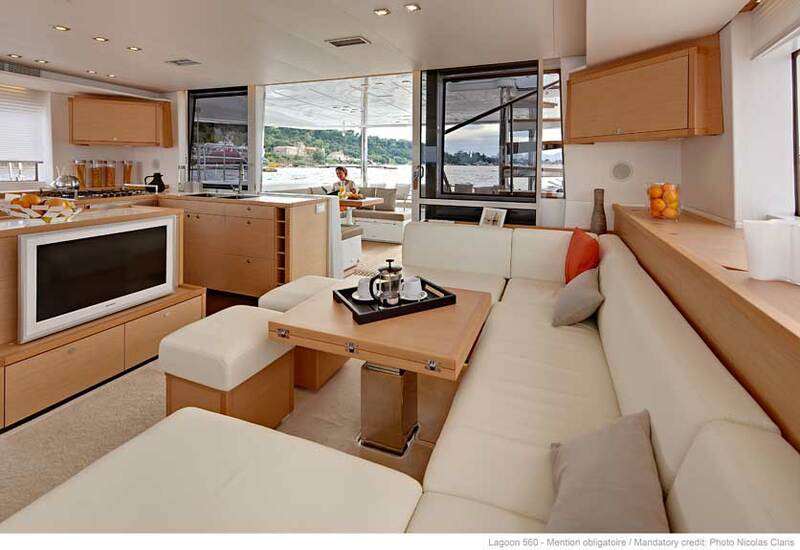 Operating year round out of St. Thomas, Tortola and Puerto Rico, the 2015 Lagoon 56 AZULIA II sleeps eight guests and has lots of teak – teak cockpit sole, teak flybridge – and lots of comfortable outdoor seating and sunbathing space. 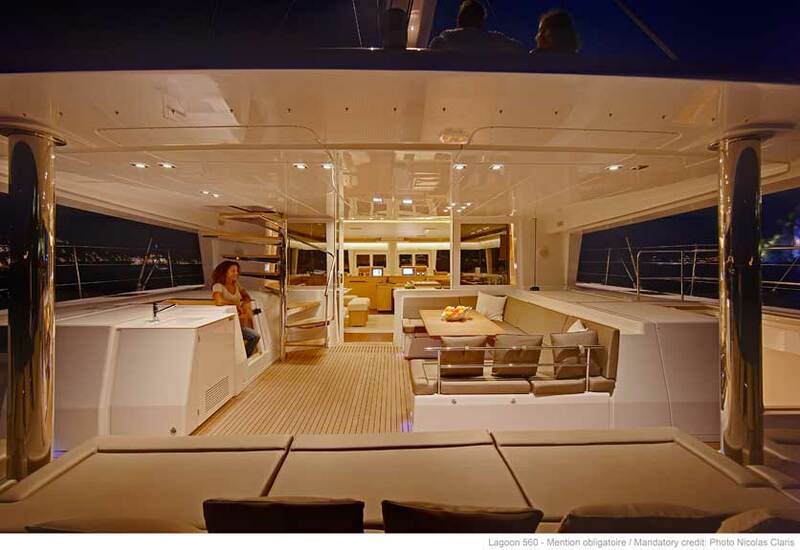 The walk-in cockpit has gray sunbathing settees and is the full beam of the ship, bar with icemaker, and dining table with beautiful table settings. 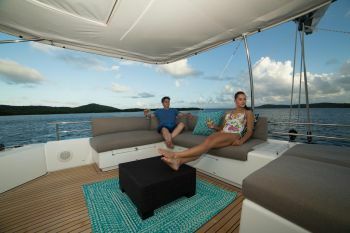 The flybridge also has a sun bed and cocktail lounge and dining table, steering station, and sun awning. The four guest cabins have white quilts and blue sea shell throw pillows, pale green sheets, and turtle art. There is tons of AC, fans, and the beds face windows looking out to sea. Some of the queen beds have steps leading up to them…..being quite high up. One is a master Queen cabin and has a glass hatch access into the cockpit that lets in lots of light. The shower stall is in the cabin, while the WC closet is in a private room. 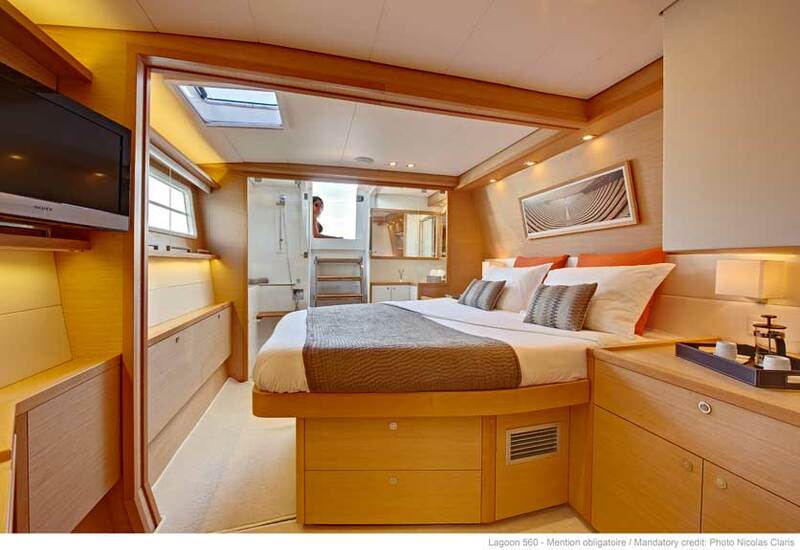 The crew will swap their bunk bed cabin with one of the guest Queen cabins, if single beds are needed. Graham and Pam Coffee are congenial hosts. They both have mellow personalities, and Pam is just as happy preparing gluten-free, low carb, or strict vegan diets as she is her regular menu. Graham offers a choice of cruising grounds. 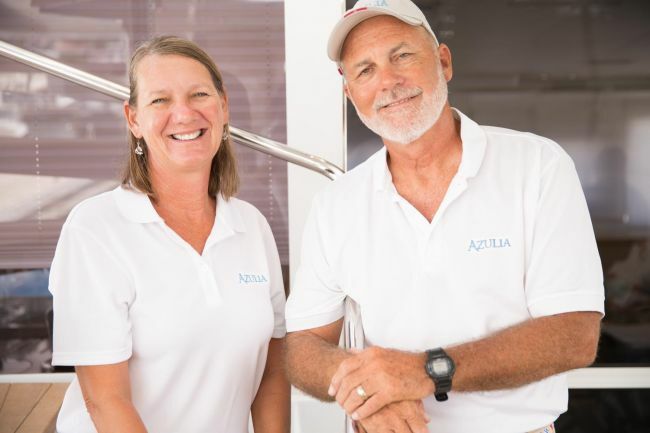 While the yacht is normally based in either St. Thomas or Tortola, Graham is very happy to offer charters in the nearby Spanish Virgin Islands, ideally starting in St. Thomas and ending down wind in Fajardo, Puerto Rico. Culebra offers lots of anchorages and is not as commercial as the BVI, great for people wanting a different cruising ground. Graham used to live in Fajardo, so he knows the area well. 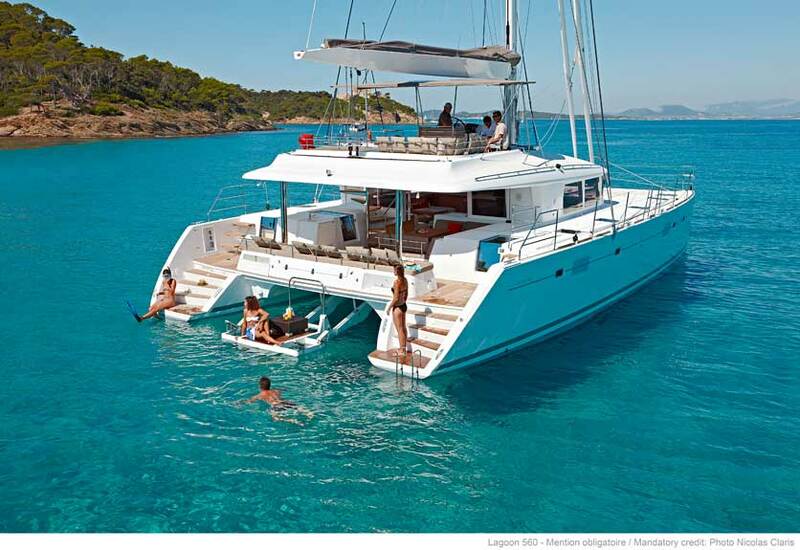 Rates are all inclusive of food, bar, fuel, operating costs. Marina/Harbor fees may not be included. 15% to 20% gratuity is not included but expected. CHRISTMAS/NEW YEAR OR EASTER HOLIDAYS: Up to 8 guests $32,000.